As we prepared to head to Charleston I researched all my food sources and without question every one of them said that we should have a meal at Husk. About three weeks before we left I started trying to make a reservation. I looked at Tuesday night. Then Wednesday night. Then Thursday night. And there was nothing available on OpenTable. So I called them and found they were completely booked from 5:00 to 10:00 every evening, although they did put us on a waiting list. It turns out that Husk was ranked as the number one new restaurant in America by Bon Appetit last fall. THAT explains why the reservation was so difficult to get. I was resigned to the fact that we weren’t going to be able to eat there at all, so we and found other places to dine. One night at dinner, Jo and I were talking about having lunch together the next day during a break in my sessions. The next morning I went online and saw that there was a reservation available at Husk at 12:15 for lunch. I sent her a quick text and we grabbed the spot. 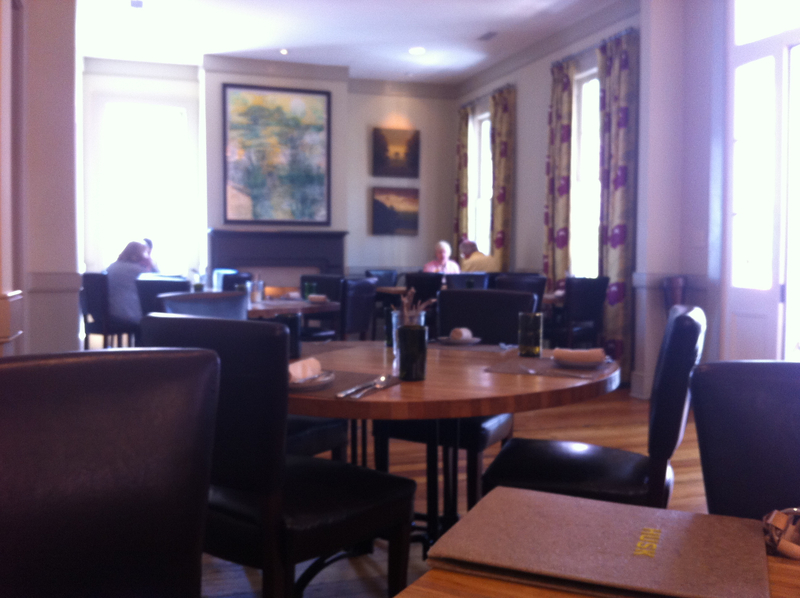 When we arrived, we were shown up the stairs into the front room, seated at our table and presented the menu. One of the things that I had seen about Husk that had caught my eye was in Garden and Gun last summer. They said their cornbread was the best that they had ever eaten. Now I’m not a huge cornbread aficionado, as my favorite cornbread of all time was the yellow stuff made from a mix that they made in elementary school, but we ordered some anyhow. 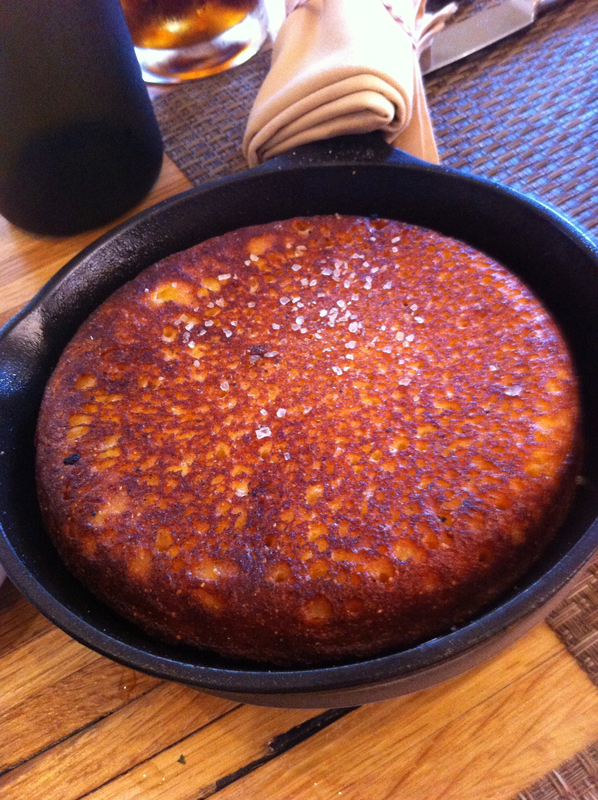 The cornbread arrived in the cast iron skillet in which it had been baked – a mix of Anson Mills cornmeal, Cruze Dairy Farm buttermilk and Benton’s bacon, with a heaping helping of bacon fat. It was good, but not as good as the elementary school cornbread of my memory. I was torn on the entrée choice between the hamburger and the pork terrine. Realizing that the opportunity to get back to Husk was probably not going to occur in the near future, we ordered the cheeseburger as an appetizer for the two of us to split, and I ordered the pork for lunch. 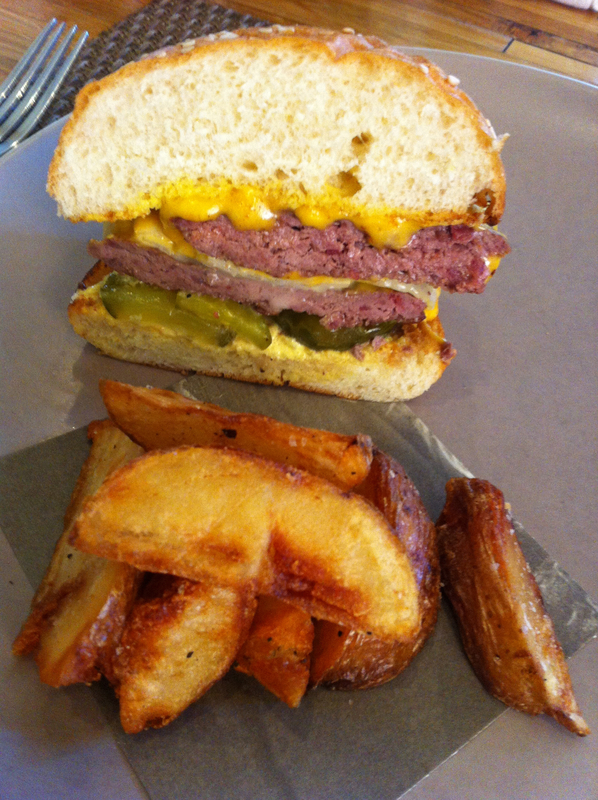 When the burger arrived it was presented on two plates – a half burger on each with a few fries. It was exceptional just as I expected. 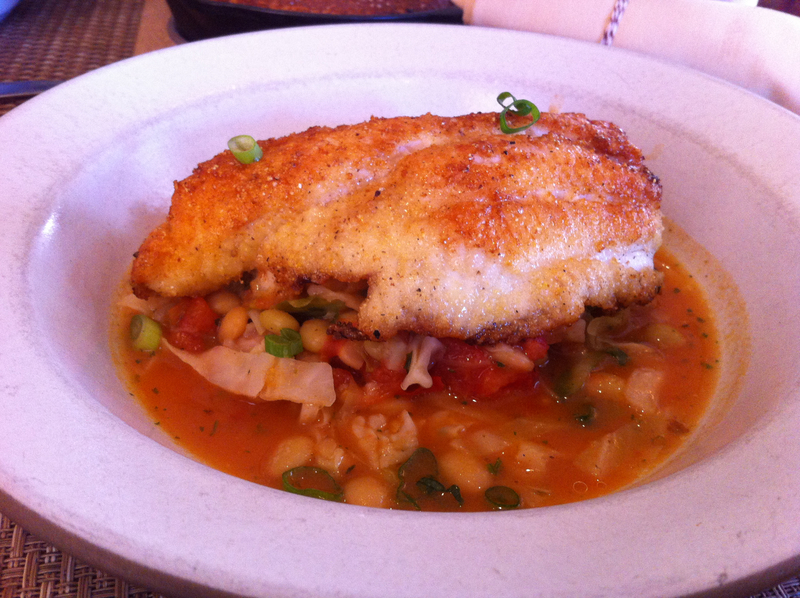 Jo ordered the cornmeal crusted catfish, served with corn, tomatoes and onions. There was very little of the catfish, or anything else, for that matter. After the experiences with the terrine at the Ravenous Pig and FIG I was somewhat confused, but after discussions with our waiter, I felt a lot better about things. It turns out this wasn’t actually going to be a terrine, but because of the shape in which it was presented that was the closest name they could come up with it for it. The pork terrine was very different, than I expected – it most closely resembled a meatloaf made of pulled pork, served with beans and rice. Meatloaf may not be the best description – it was like pork plywood, where all of the parts were pulled pork. 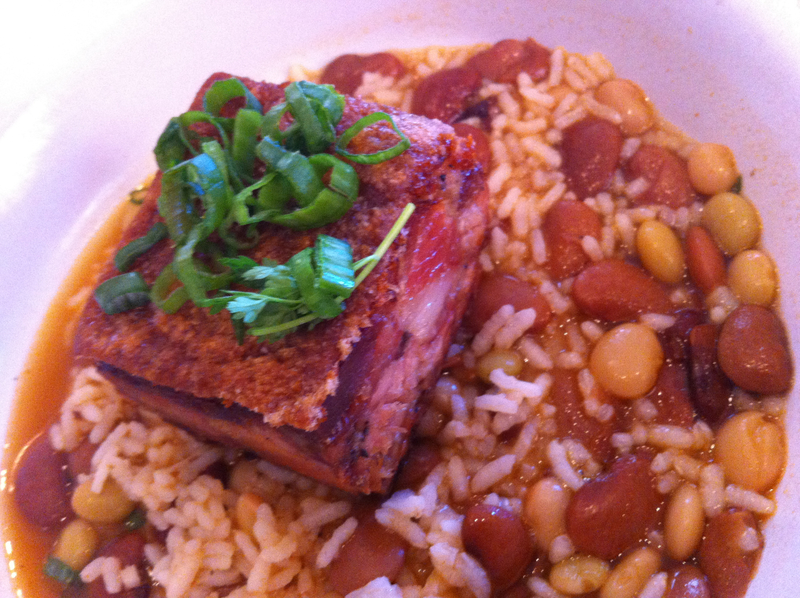 It was good, but when the beans and rice were added, the taste stepped up to great. We discussed the idea of dessert, but decided that I couldn’t afford to sleep through all of the afternoon meeting, so we went on our way. 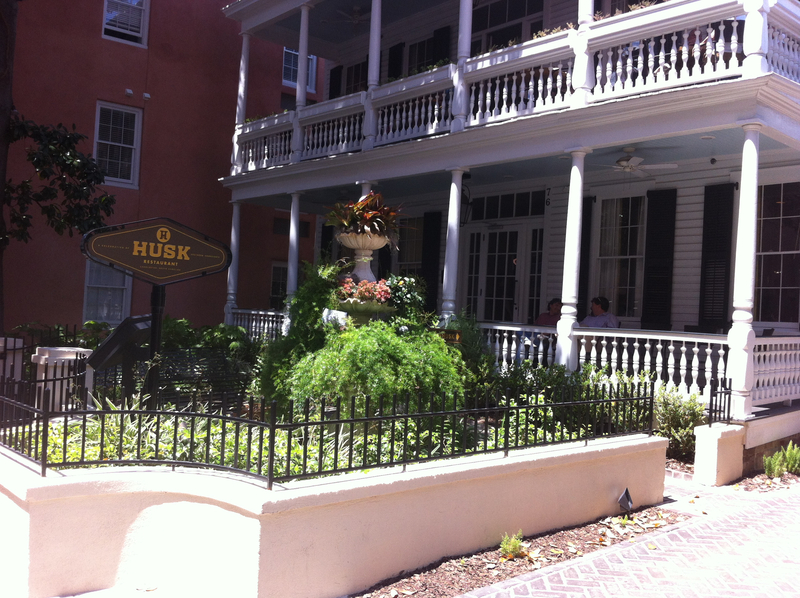 All in all, I’d recommend Husk to anyone dining in Charleston.